The wind farm at Hiyama Heights had 14 wind turbines each of which had 2MW of generation power. It generated the total 28MW of electricity which was equal to the load of 18000 households. The wind farm was located in the altitude of 900m. 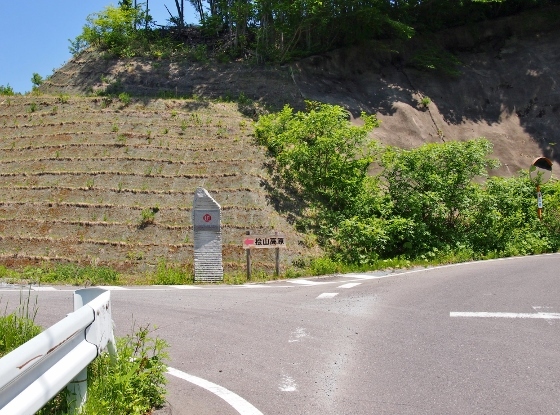 Approaching Kawauchi Village on the local Route 112, I found a guide sign for Hiyama Heights as shown above and I turned left. The location was red asterisk 1 in the map. As I went ahead the road became unpaved gravel road for about 1.5km and soon some wind turbines welcomed me as shown above. I walked with my bike on the unpaved road. Then I found a road branch as shown above and as I turned left the road became paved again. The location was red asterisk 2 in the map. 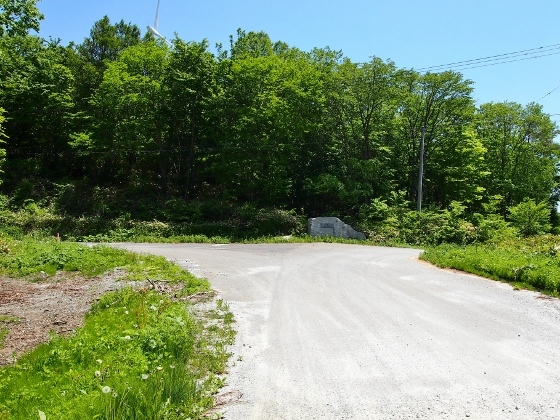 The road branch was located on the border between Tamura City and Kawauchi Village and turning right would bring you to Kawauchi Village. 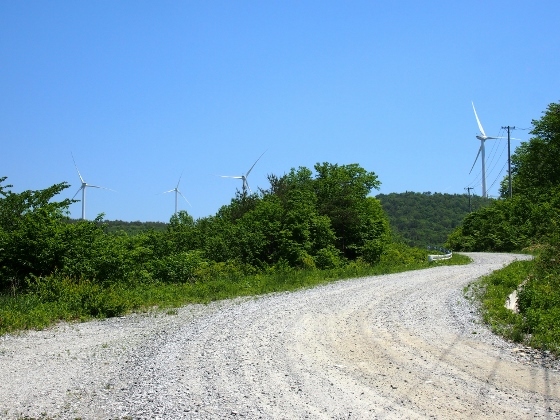 As I went ahead on the paved road many wind turbines welcomed me again. 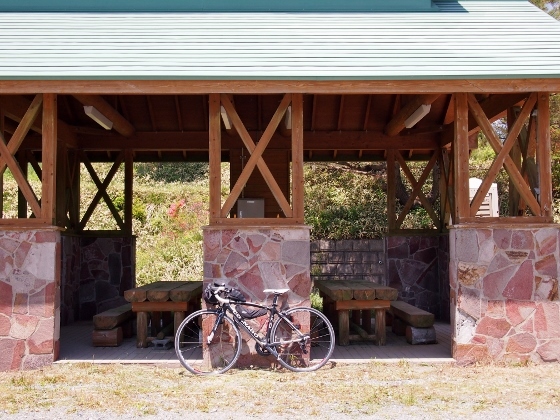 At the end of the road there was a rest area with benchs and roof. They were actually facilities for babecue and camping. 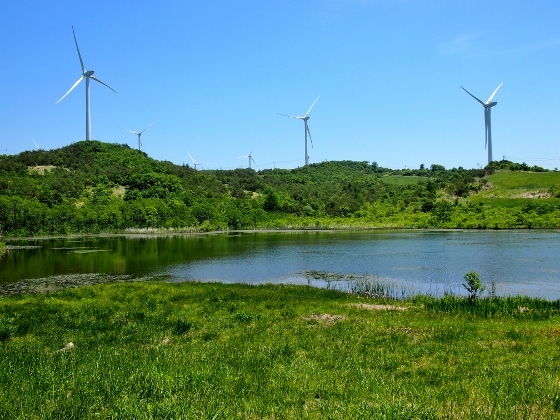 The view from the bench was as shown above including small pond in front and many wind turbines surrounding in the background. The location was red asterisk 3 in the map. 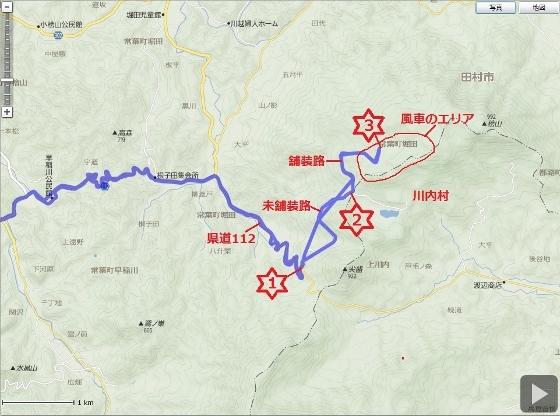 The wind turbines were located near the border area as shown by the red circle in the map. Today the wind turbines were not rotating possibly due to maintenance or lack of wind. 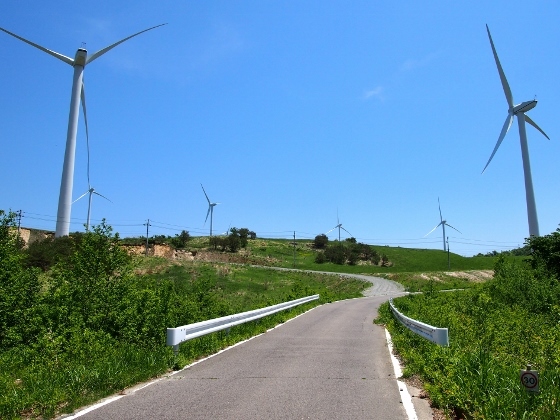 Renewable energy part 2 brought three major wind farms in Fukushima Pref. This article will be the end of the part 2.